" I am helping " A Family's Hope become a Reality" Wouldn't you like to help also ? 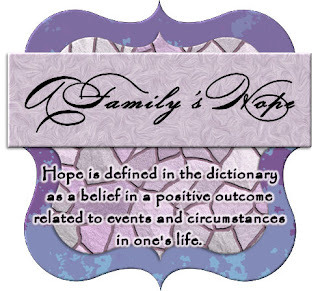 I am helping "A Family's Hope become a Reality"
A family’s hope…Hope is defined in the dictionary as a belief in a positive outcome related to events and circumstances in one's life. With your help, this family can finish getting the money they need to get back on their feet and start fresh. For the past several months, they have been living in an efficiency apartment trying to save enough to move in to a bigger place. Tough economic conditions have put a strain on the family budget on a weekly basis. Yet, through all of this, they have never lost faith that they would be able to turn things around. This new year has shown how love has held this family together through it all and they have been blessed to have found an affordable apartment that is big enough to accommodate them. A group of designers are joining forces to help our dear friend raise the extra money needed for this dream to become a reality. All proceeds from this collaboration kit will go directly to help this family continue to bounce back. Thank you so much for taking the time to read this and purchasing our kits. ( Available today at http://www.paradise4scrappers.com/ ) ...If you do not see it there when you first visit - keep checking back, it will be in the shop today, Monday , January 26th. Want a preview of what you will be purchasing, believe me when I say, the price is well worth the kit. So, not only are you helping this family out - you are also getting a package of scrap kits from various designers that you will find many uses for. Just look at this image ! If you purchase this package by " Adding to shopping cart " - you will receive links to download this wonderful package of scrapkits. Don't miss out. And please be sure to let your friends know about this cause and this scrap kit that they can have also by sending them to http://www.paradise4scrappers.com/. Each designer that has contributed to this collaboration kit has their own tou's within their folders ..... Please always read designers tou's to see what is able to be done and/or what is not able to be done. Here is a preview of my part in this awesome kit! On that note, we'd love to take this moment to thank each and every contributor listed below. You will never know just how much your contribution means to this family. Thank you so very much for sharing of your talent, your time and your heart. Again, Thank you ladies for your contributions, especially on such short notice. ! After a little thought i figured I'd update my post from yesterday with a bit more information. Hi everyone,You know how good it makes one feel to help others out but we often don't have the finances to help someone ? Well, you can make a big difference by contributing to a collaboration scrapkit that is in the making. This kit is for " A Family's Hope" .. There is a color palette which I will add here, just right click and save. - and please do forward onward or send your friends here to pick it up and see if they too would like to contribute ... Every little bit helps. Please read below for more information. Please make a preview to go with your kit. Please be sure to include a tou information with your kit as well that way we can get all info included. Kits need to be completed and turned in by Jan. 26th and the kit will be available in a few stores for purchasing. All monies will go to the family. Do you have a few seconds to spare to help " A Family's Hope" become " A Family Reality"? Hugs and hope to hear from you soon. A family’s hope…Hope is defined in the dictionary as a belief in a positive outcome related to events and circumstances in one's life. With your help, this family can finish getting the money they need to get back on their feet and start fresh. For the past several months, they have been living in an efficiency apartment trying to save enough to move in to a bigger place. Tough economic conditions have put a strain on the family budget on a weekly basis. Yet, through all of this, they have never lost faith that they would be able to turn things around. This new year has shown how love has held this family together through it all and they have been blessed to have found an affordable apartment that is big enough to accommodate them. A group of designers are joining forces to help our dear friend raise the extra money needed for this dream to become a reality. All proceeds from this collaboration kit will go directly to help this family continue to bounce back. Thank you so much for taking the time to read this and purchasing our kits. If you would like to contribute to this worthy cause, please feel free to contact me for more information. Kits will be collected for another week.